Raseiniai ; Samogitian: Rasein?, Polish: Rosienie is a city in Lithuania. It is located on the south eastern foothills of the Samogitians highland, some 5 km (3.1 mi) north from the Kaunas–Klaip?da highway.Coordinates: 55°22′N 23°7′E. Raseiniai was mentioned for the first time in 1253. The town was among the first Jewish communities established in Lithuania, and the city, which is known in Yiddish as Raseyn, became known as the "Jerusalem of Zamut." Jews continued to settle there in large numbers throughout the 17th century. Rabbi Nosson Zvi (Nota Hirsh) Finkel (1849 - 1927) was also known as the alter (elder and Sabba) of the Yeshiva of Slobodka. Born in 1849 in Raseiniai. Abraham Mendel Drexler (nee Toker) born in 1860 in Raseiniai with his wife Chaia Beile. Gita Aleksnyanski lived in Rasseine, Lithuania. During the war she was in Rasseine, Lithuania. Gita was murdered in the Shoah. Khaim Aleksnyanski was born in Lithuania. He was a tanner and married to Gita. Prior to WWII he lived in Rasseine, Lithuania. During the war he was in Rasseine, Lithuania. Khaim was murdered in the Shoah. Raseiniai Faynberg, L. (Written on back in Yiddish) "The marketplace with a statue of the great Vitautas." Raseiniai A group of people pose with a horse on "Yatkes gesl" (Butcher's Lane). 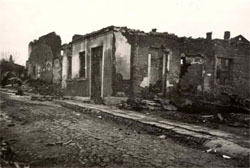 (Left) a man sits near the doorway of a dilapidated building. People near a synagogue. (Left) a wooden house with an open window. (Written on back in Yiddish) "The 'kalte' [cold] synagogue." (Written in Yiddish) "A corner in Krizis Street": two men sit on logs in front of a sunken wooden building; (left) children smile at the photographer. Members of the He - Chaluts movement in the "Chaim Arlosoroff" pioneering training commune (kibbutz hachshara) in Raseiniai. Photographed in May 1934. On the back of the photo are signatures of the members. Some that appear are Shlomo Rochman, Aba Rozin and Pesza Gitelson. Members of the He - Chaluts movement from the pioneering training commune (kibbutz hachshara) in Raseiniai. In the photo: Elchanan Fig, a member of the He - Chaluts ha - Tsa'ir secretariat (top row, on the left). Photographed in 1936. Members of the local chapter of the He - Chaluts Ha - Tsa'ir youth movement in Raseiniai. Photographed on May 7, 1934. Raseiniai, Lithuania, A view of the town, Prewar. I received from Lithuanian archive in Kaunas picture of 1939 passport card for Wolf Berman from Kaunas but with family roots from Raseiniai. Wolf Berman is a son of Eiliah Berman and grandson of Golda Wolpe. July 29, 1941 in Raseiniai, Lithuania, the first shooting of Jews and several communists took place. 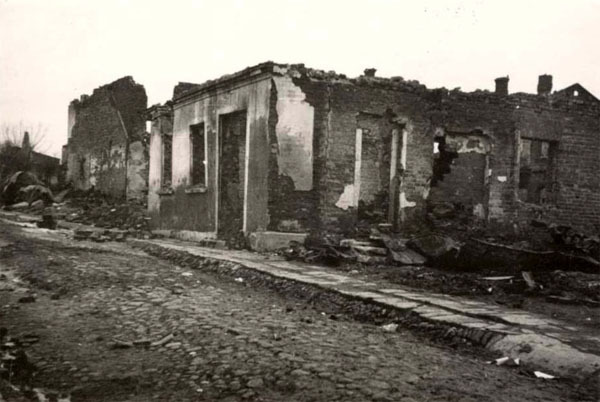 Several hundred Jewish men were shot 5 km from town, in mass graves that had been dug by locals. Arturas-Andrias, born in 1932, witnessed the shooting and recounted to our team, "Some villagers were ordered to broaden the gravel pits. They were 3 m wide and 50 m length. The group of Jews was stopped on the road, and then 20 persons were brought to the pit. They were beaten with sticks and told to lie down in the pit. Then they were shot. A layer of soil was spread on top and another small group of Jews was brought to the shooting." Below, Arturas-Andrias visits this execution site with the Yahad team.